When I'm at the cottage, chances are this is where you'll find me. It wouldn't be a cottage without a porch. Lazy breakfasts, afternoon naps, nighttime relaxing with the lights on and the music playing... that's what I was hoping for with this outdoor space. Come join me, won't you? I'm really thrilled with the porch furniture. As soon as I saw this outdoor set by GlucksteinHome I knew I had to have it and luckily I was able to grab the very last floor model at the end of last summer. It's a gorgeous British Colonial style with typical features like caning and turned legs rendered in aluminum. I only wish the cushion covers were a darker colour and were removable. Cream cushions aren't the most practical but I can always get them recovered. Which is just what I did with the ottomans. To change things up and to enhance that plantation tropical flair a little more, I had the ottomans recovered in an outdoor bamboo fabric. They look so good! The custom sewing was done by Tonic Living. 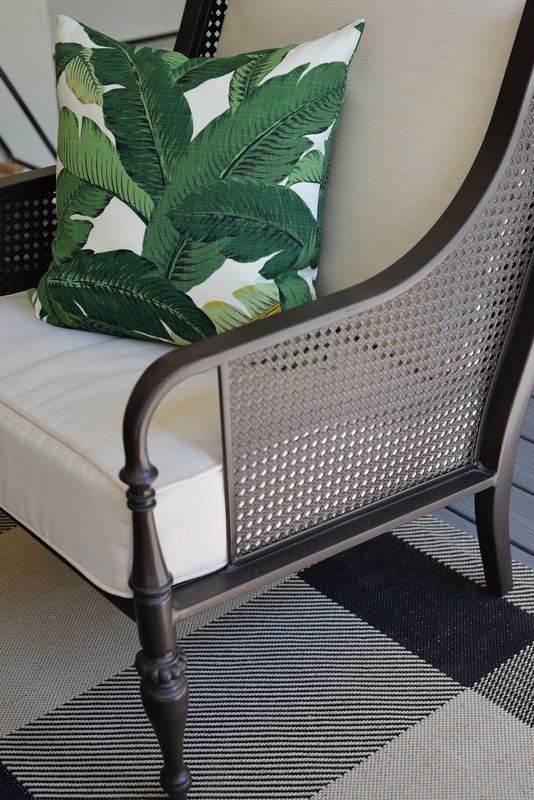 Tonic Living is known for their fabrics and pillows but I've used their custom sewing services for everything from roman blinds, to curtains, and custom bench cushions. They always do an amazing job. To define the sitting area, I added a large scale plaid rug. 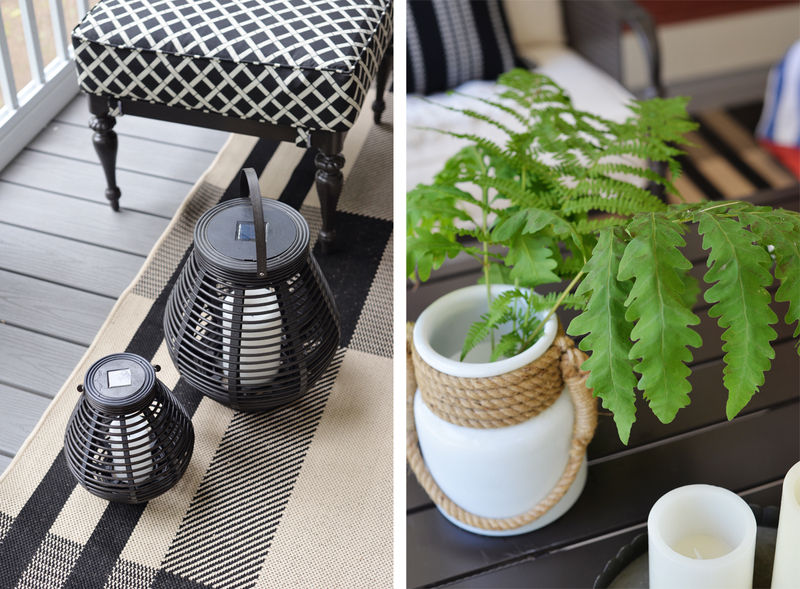 The black and bone coloured rug pulls the palette together. 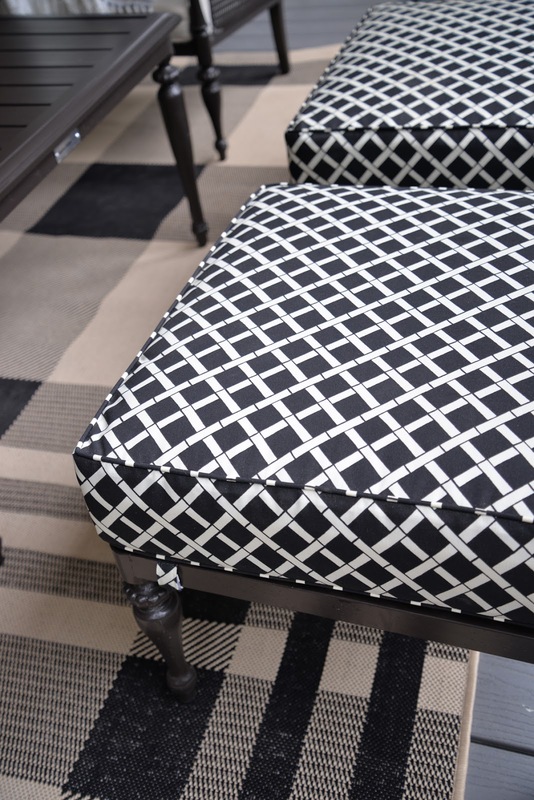 I'm crazy in love with this mix of patterns - large plaid, geometric bamboo, small scale caning. It's farmhouse meets the tropics. You can't have the tropics without a bit of greenery. 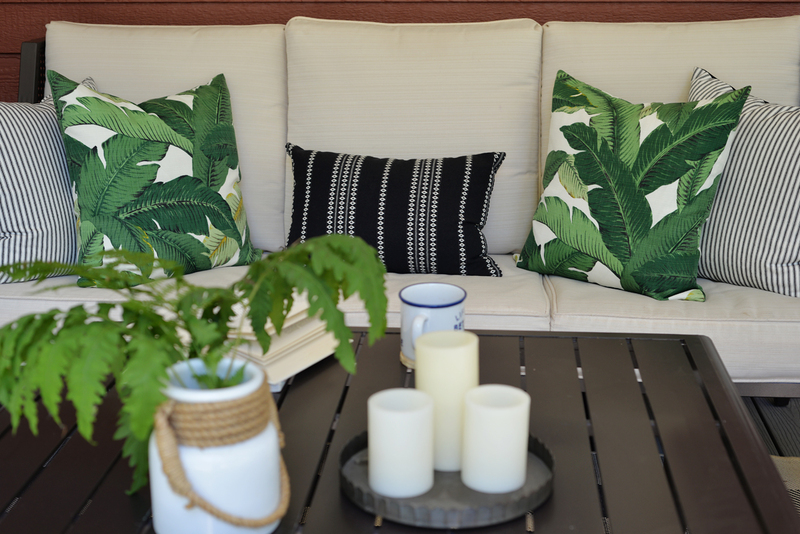 I swapped the blue outdoor pillows the set came with for this collection of pillows from Tonic Living. 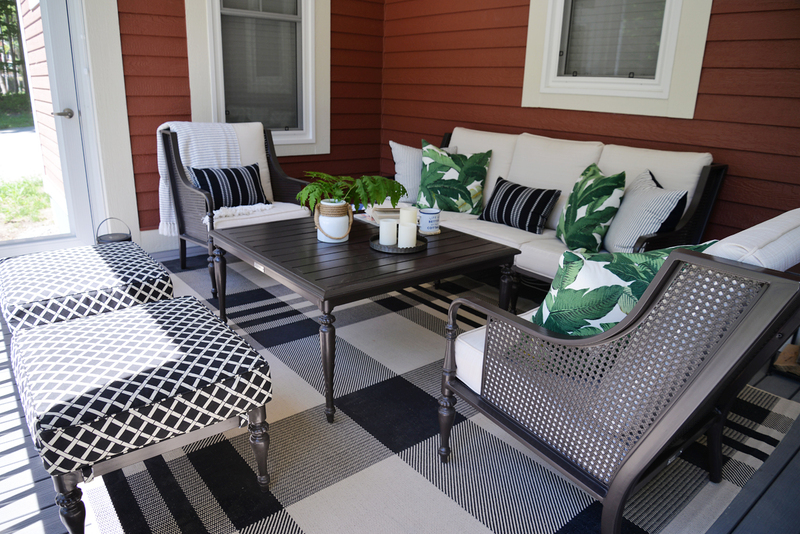 Since the porch is screened and the cushions are well protected from the elements, I went for a mix of indoor and outdoor fabrics. 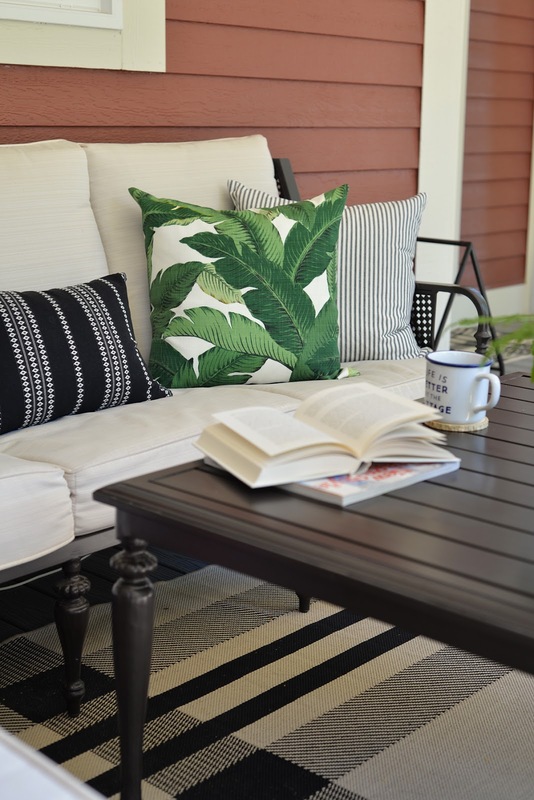 The famous Swaying Palms pillow is a perfect complement to the Boho Stripe lumbar pillow and a pair of custom pillows with Classic Ticking on the front and a Basic Twill on the back. Since this is an outdoor space, I didn't want the decor to be too precious. Solar lanterns from The Home Depot Canada cast a warm amber glow at night. A milk glass vase is filled with cuttings from the surrounding woods. 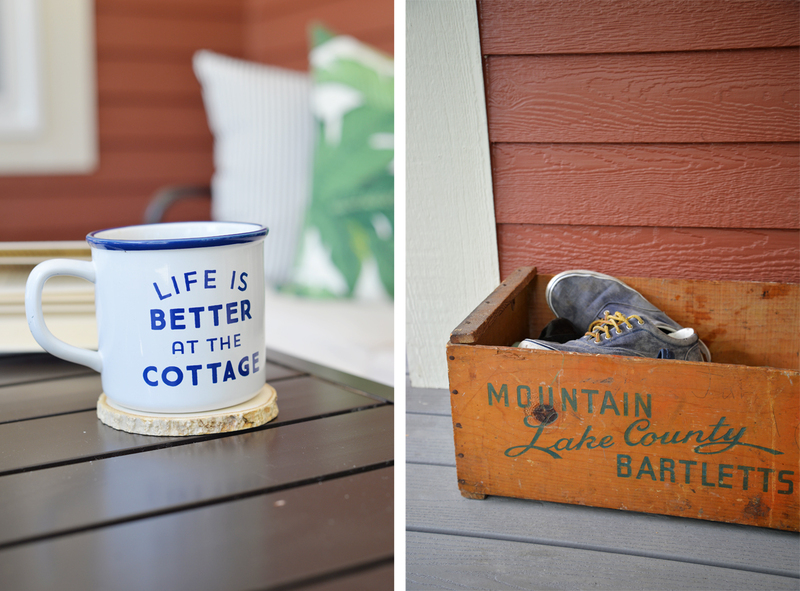 An old crate from the Christie Antique Show holds our summer shoes by the front door. 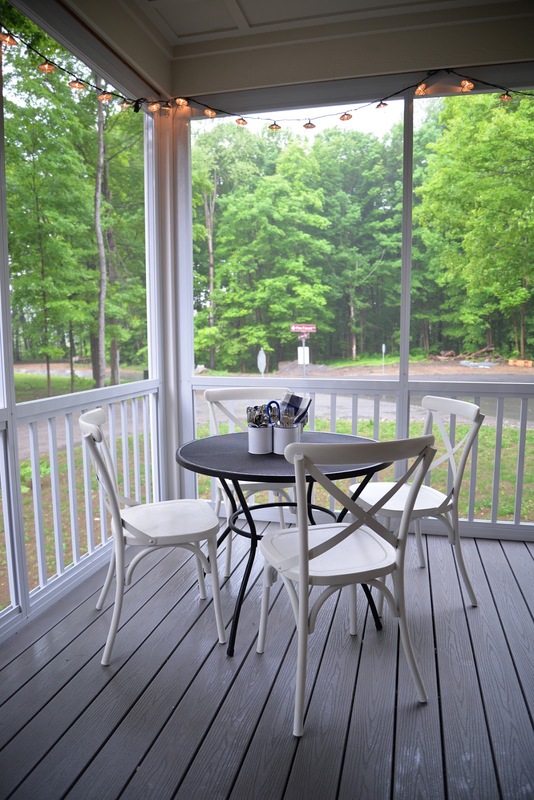 The other side of the porch is used for a small dining area. 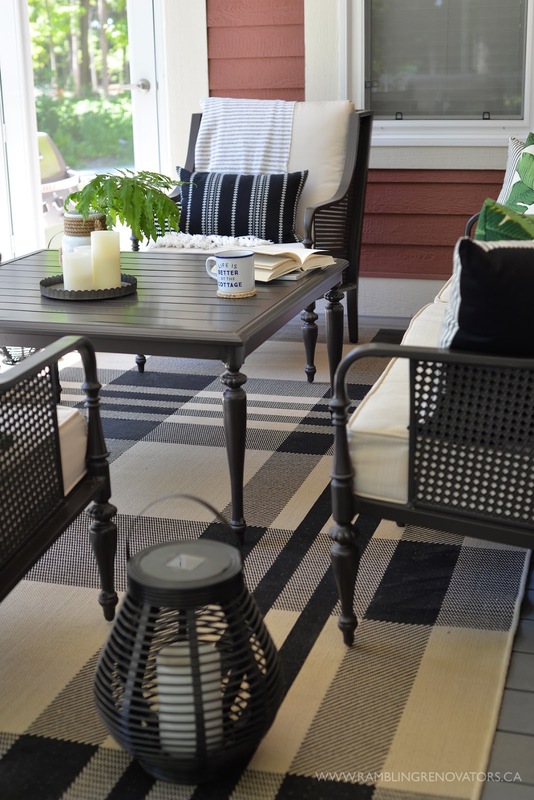 I picked up the x-back metal chairs from Pottery Barn and the steel mesh dining table is from The Home Depot Canada. It's a cute spot to enjoy our morning breakfast. Can you see the caged string lights? 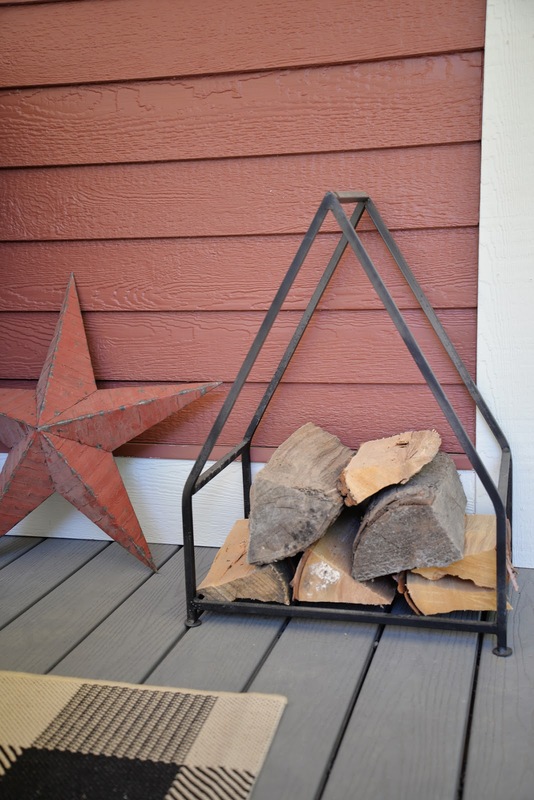 They add to the farmhouse feel. I love sitting out here at night, string lights and lanterns glowing, just breathing in that fresh country air. That's the porch tour. Come back tomorrow because I have a fun giveaway with one of the items you see in the photos!